He will always be back. Just like Star Trek (2009), Paramount/Skydance productions have used time travel to give us a new spin on an original story. 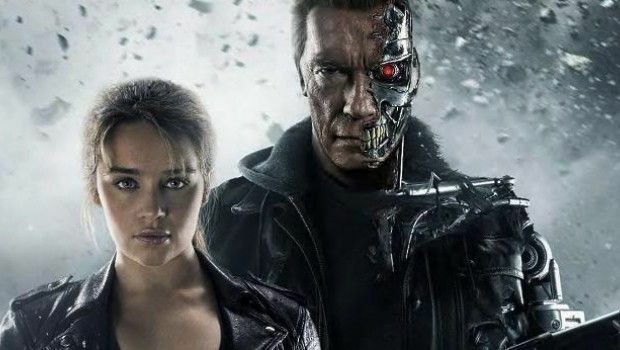 Post apocalyptic soldier Kyle Reese (played well by no stranger to franchises that should stay dead- Jai Courtney) is sent back to 1984 to save waitress Sarah Connor from the T1-800. The mission has changed, soldier. Sarah is all too aware of her future thanks to one of many incarnations of Arnie. Here we see more of a T2: Judgement Day heroine, played by Game of Thrones Emilia Clarke. The film follows the typical action formula that at times come at a sacrifice to the alarmingly convoluted plot. The dialogue and visuals are there to bring laughs too; reminding everyone watching, this franchise has forgotten its roots. It has has gone the exact same way as another beloved of mine; Die Hard. Both started with hard 18 ratings. They were tense, they were cool. Hell, these veteran action heroes deserve better than this, and so do we. It’s worth a watch if you’ve already managed to get yourself through editions 3 and 4; it’s no less painful and has enough nostalgia to feel like time well(ish) spent. It wraps itself up nicely. A little too nicely, if you ask me. I don’t buy it and it’ll feel even cheaper when the sequel comes around.